Some of the biggest Internet brands have declared their love for BitTorrent in recent months. Both Facebook and Twitter are using BitTorrent to update their networks and not without success. In Twitter's new setup the BitTorrent-powered system has made their server deployment 75 times faster than before. Large scale web-services such as Twitter need thousands of servers to manage the flow of updates sent out by their millions of users. As a result, keeping all these servers updated with the latest data can be time and resource intensive. To improve the deployment of files across their servers, Twitter recently called in the help of BitTorrent. After having considered several scalable deployment options, BitTorrent turned out to be the only candidate that met their standards. “It was time for something completely different, something decentralized, something more like.. BitTorrent.. running inside of our datacenter to quickly copy files around,” Twitter engineer Larry Gadea explains. With BitTorrent, Twitter hoped to distribute files faster and more efficiently, saving time and precious resources while improving the scalability of Twitter’s operation. Earlier this year the new BitTorrent-powered system was rolled out and didn’t fail to impress. “Using the file-sharing protocol, we launched a side-project called Murder and after a few days (and especially nights) of nervous full-site tinkering, it turned a 40 minute deploy process into one that lasted just 12 seconds,” Gadea commented. BitTorrent is 75 times faster when compared to the old server deployment system, reducing deployments across thousands of servers to just a few seconds. With BitTorrent, every server not only downloads the new files, but also becomes a distribution point that helps to spread it to others. 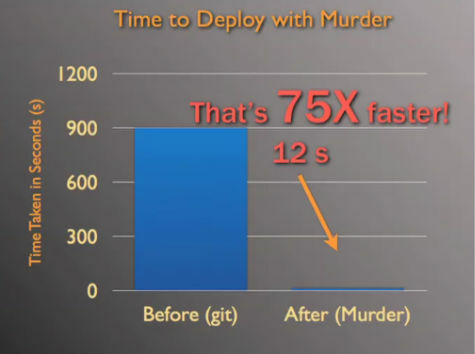 Larry Gadea, who says he’s an avid BitTorrent user himself with experience of downloading tons of Linux ISOs, named Twitter’s new deployment system ‘Murder’ after a flock of crows. The code is based on the BitTornado BitTorrent client and available to the public and licensed under the free software Apache License. The BitTornado client was chosen as the base code for its openness, Gadea explained, so Twitter can redistribute their code to other developers without running into licensing issues. It’s beginning to look like BitTorrent may become the standard for large-scale networks wanting to update their machines quickly and efficiently. With huge brands such as Facebook and Twitter adopting it, we can only expect that others will follow their lead. Twitter’s Larry Gadea explains a bit more about the Murder setup in the presentation he gave at the Canadian University Software Engineering Conference earlier this year. c There are 40 comments. Add yours?